A number of students have been attacked in Gothenburg. Inspector Winter and his team are puzzled, not only by the strange mark the weapon leaves, but also the sometimes evasive nature of the students themselves. Are they trying to hide something? This is the third of these novels published in English, though several earlier ones remain to be translated (my current pet-peeve: translating novels from the centre of a series, and leaving the first untranslated). 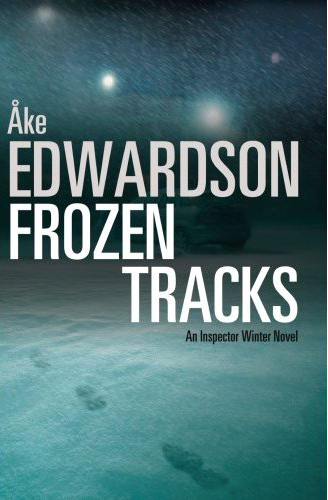 It is also the third of Edwardson's novels to have won the Swedish Crime Academy Prize for Best Crime Novel, though the first of those novels in English. Anyone who has read any of these before will probably have the measure of Edwardson's style by now: crimes come to be solved through conversation and discussion among colleagues, a slow accrual of thought and ideas, pensive examinations. There's little explosive action, or even blood: it's a habit of Edwardson's to turn his head away from violence, and merely describe its effects. We know a young boy is assaulted, but we have no idea of any specifics, the only clue we have is that his parents are told "he will see again". This is all the reader ever knows about the specifics of the assault. While I admire the flash-free nature of his style, I'm not sure about this habit of shying away from describing any kind of violence. In an earlier novel, SUN AND SHADOW, it irritated me greatly as I didn't really feel I knew what had gone on, I had an uncomfortable sense of there being important gaps in the story that I wasn't used to. The resulting crimes, and sometimes their investigation, can feel a little sketchy and amorphous. However in FROZEN TRACKS it isn't so important, as there's not a lot of violence anyway. Edwardson's novels, I think, are the ones which most closely resemble the excellent procedurals by Sjowall and Wahloo. Those novels, too, had a heavy focus on crimes being solved through discussions among colleagues, and featured the rendering of an entire police team rather than a single investigator. As with their Martin Beck novels, Winter is only the figurehead, and the focus is often as much on other investigators as him. These are very much team novels. As a result, and due to their dialogue-heavy nature, they may be slow-paced but they paradoxically read quite quickly. FROZEN TRACKS is a long novel, but it didn't feel it. Another odd habit of Edwardson's is that he seems, to me, to break things off - interrogations, discussions - at the point when they really seem to be getting somewhere. Though this may only seem odd given that - as there are passages from the criminals point of view - we know more than the police, which has the unfortunate effect of sometimes making them seem a little slow in their investigations, regardless of whether they are or not! Overall, there are many things I admire about Edwardson's novels, but he has stylistic habits that I think I'm just not used to (rather than them being bad), which somewhat prevent me from putting him at the top of the tree of Scandinavian crime writers. Read another review of FROZEN TRACKS.